Hi! I’m doing it on Android, our demands has some differents. First, I must get a shot of screen, and then blur it, then show it immediately. I am write it with C program, and build with NDK. But I got some trouble, I must done with it lower than 200ms, but I did’t found a way to do it. So, can you give me some help or suggest? Thank you very much! Sorry for my english. 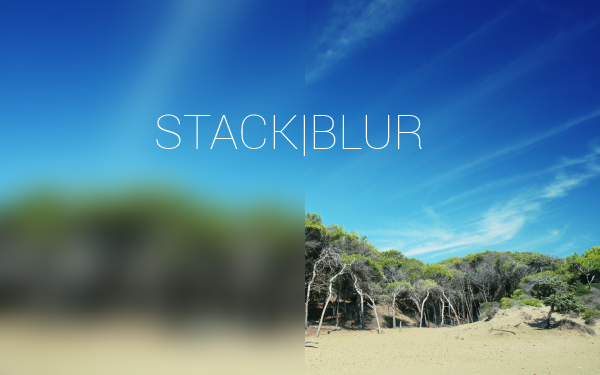 Do you have trouble to perform blur fast enough or to get/show image? Blur part speed should depend on device resolution in your case. May be its even good idea to use every second pixel in case of full hd device resolution. For normal case algorithm described here should work under 200ms – how fast are your results? May be slow part is on java side when you provide image data to blur. Is there a MATLAB implementation? Or maybe Pseudo Code / C Cdoe with no optimization just to understand the method? I dont know about matlab implementation, but you can probably look into JS version as it expected to have more obvious code (http://www.quasimondo.com/StackBlurForCanvas/StackBlurDemo.html). I can’t seem to find MVThread. I’ve tried searching your blog, as well as the internet, but can’t seem to find it. This is just simple thread class – contains virtual void run() function to do some job asynchronously. Has start(); and wait(); methods – one runs thread task and another waits until its finished. So you can use any thread implementation here (c++11 std::thread, boost::thread from boost lib, etc).